The girls and I had a little art session yesterday. Usually it starts with me pulling out something to work on and pretty soon they are right by me crafting away. I had all three of them side by side yesterday and it was a lot of fun. 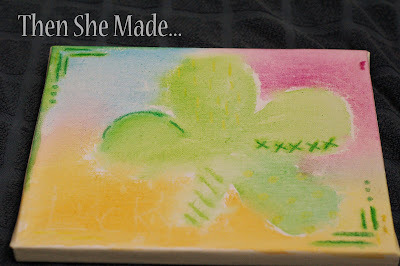 We were playing with a crayon wax resist paired with water color. I made a St. Patty's theme piece and while I like it, I'm not in love. Sometimes things just don't look like you think they will in your head. It's life. It's ok. However, it was fun to make and I think with some tweaking I could make something that I would love. I think the idea has potential. If you want to tweak the idea and play around with a fun project, here's what I did. It was pretty easy. 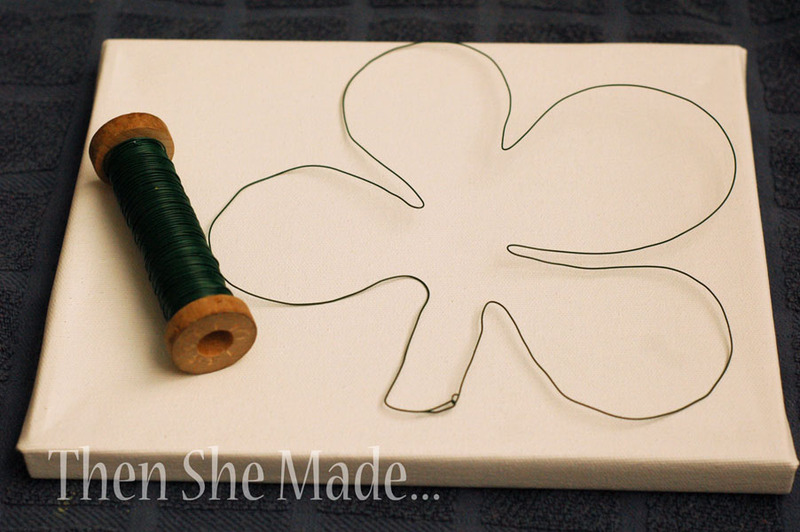 Step 1: Take a piece of wire and shape it into a shamrock shape. Floral wire is pretty forgiving so you can shape, un-do, and reshape until you get it how you want it. 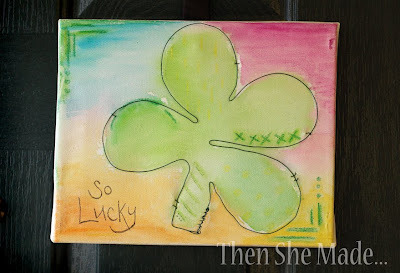 Step 2: Position your shamrock on the canvas how you want it, don't hook it down yet though. Then using crayons I added some simple designs. I was just playing around but added some straight lines here and there so I could tell were the shamrock would be on the canvas. I also used more than one color of crayon. Not sure why but I did and it worked. Step 3: Next, I just added some water color. I kind of used a color blocking design that I thought kind of looked rainbowish. Step 4: Once the paint is dry attach your wire shamrock. 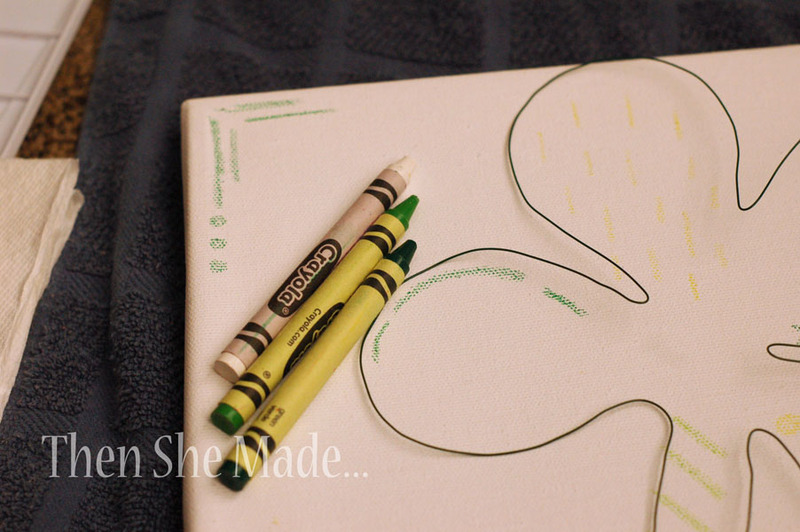 To do this, I actually poked small holes in my canvas and used small pieces of wire to hold it in place. I pushed the wire pieces up from the back of the canvas, over the wire design on the front, and then pushed it down to back again. It's like a little stitch. Step 5: Finally, I added the words "So Lucky." 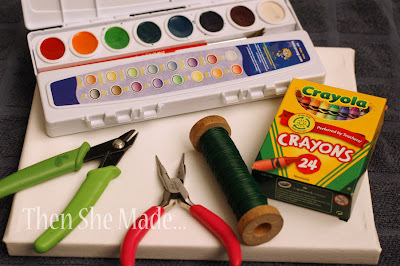 I think next time I'd use rub-ons for this but the hand written words kind of compliments the messy water color look. So that's it. I think I will tweak the idea a bit and make a better one but for now, it was just fun to create with my kiddos.